This morning Ken Rosenthal said that the Cubs were shopping David DeJesus and Nate Schierholtz. I did a trade value on Schierholtz a few weeks ago, noting that it would probably take a Grade B hitting prospect to land him. Let’s take a look at the value of DeJesus, which will provide a better opportunity to compare both players. NOTE: The purpose here isn’t to suggest the Pirates are offering this amount for these players. The purpose is to see the value of these players, using projected values (calculated as [(WAR*$5 M) – Salary]) and prospect trade values. We use our updated values for top 100 prospects, and Victor Wang’s research on prospect values for non-top 100 prospects. Also check out our values for the prospects in the Pirates system to get an idea of what a deal would cost for the Pirates. David DeJesus is worth a Grade B hitting prospect. Finding the Value: DeJesus is making $4.25 M this year, and has a $6.5 M option in 2014 with a $1.5 M buyout. I averaged his WAR from the last four seasons (including a projected 2.4 this year), and got a WAR close to 2.0. I feel that’s fair, since he is getting older, and he has also fallen under that mark in the previous two years (1.9 and 1.3). What He’s Worth: A $5.7 M trade value is worth a Grade B hitting prospect. That’s similar to the value of Schierholtz. It’s possible that a team could get DeJesus for two Grade C pitchers instead, depending on the Cubs intentions. If they’re not looking to carry DeJesus and Schierholtz next year, they might be more inclined to move one of them, even if it’s not for a big prospect. If they are fine with both, then they’d have more leverage to go for that bigger prospect. Analysis: DeJesus has slightly more value than Schierholtz in our trade value analysis. However, Schierholtz is having the better season in 2013. The reason DeJesus grades higher is because he has been fairly consistent the last few years. This is more of a career year for Schierholtz. There are arguments for either side. For DeJesus, there’s more comfort that you’re getting a guy who has been consistent. He’s been at a 1.9 WAR or greater in all but one season since 2005. That one season was last year when he had a 1.3 WAR, mostly due to some horrible defense, which isn’t usually the norm for him. The downside is that DeJesus is a few years older than Schierholtz, so there’s a chance his numbers could decline. Schierholtz doesn’t have the career success of DeJesus, but he is only 29, and would be a few million cheaper. If you believe he’s somewhat legit this year, then he also has more value than DeJesus. He’s got an .885 OPS against right-handers, compared to an .825 OPS from DeJesus against right-handers this year. 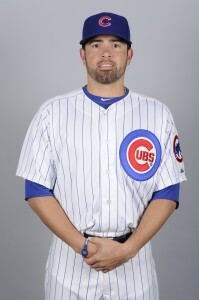 There’s probably a reason why Rosenthal says the Cubs would rather trade DeJesus. Both players are left-handed hitters, so they should play well in PNC Park. Both guys are strictly platoon options, so the Pirates would have to find someone who could hit left-handers. The Pirates have been hoping for DeJesus/Schierholtz production out of one of Jose Tabata or Travis Snider, but haven’t gotten that this year. Trading for one of these guys would pretty much guarantee you’re going to get production in right field against right handed pitching for the next year and two months. It wouldn’t be a huge splash, but it would provide an upgrade at that spot. If I had to choose, I’d go with Schierholtz. DeJesus has the advantage that he’s been better in previous years, plus you’ve got all the Big Lebowski jokes. But Schierholtz is younger, cheaper and is playing better right now. The only risk would be that this is a career year and he doesn’t play this way next year. But I think you also have the risk of DeJesus seeing his numbers decline due to age, and that might be a bigger risk. So of the two players, Schierholtz is the better option. I prefer Schierholtz. Would Matt Hague and Snider be enough? I might lean more towards DeJesus – just strictly looking at the players alone. Reason I say that is he has at least had a track record in his career of being an everyday player, including hitting lefties. Understand he is older, and Schierholtz is seeing a power pop this year – just not sure I am buying Nate. But, he has at least demonstrated a good BA against righties last three years. So, it is still a close call for me. I think 2.0 WAR is a generous projection. He’s a platoon bat, and at age 33-34, his baserunning and fielding skills should only be considered average going forward. I’d take him over Presley, I guess, but he doesn’t seem like a big upgrade. I agree Schierholtz is the better choice of the two. You have Josh Bell and Barrett Barnes rated as Grade B hitting prospects. Should the Pirates be willing to trade either of them for Schierholtz or DeJesus? Barnes is injured, and I think Bell is closer to a top 100 prospect than Grade B. I’d probably put him in the middle between those values. So, no. I wouldn’t deal Bell for those two. Thanks, Tim. I thought Bell seemed like a little more than the Pirates would want to trade for Schierholtz.